Timbaland's name is inseparably linked not only with success of numerous Hip Hop stars but also with the very process of establishment of this genre. It is hard to believe that only ten years ago Timbaland was just a cog in gigantic machine of sound recording. But this cog turned out to be a pretentious one. Creating unusual beats and original arrangements Timbaland has crossbred R&B and Hip Hop and helped to put a whole new industry on its feet where he himself took a central position. At least names of such Timbaland's clients like Missy Elliott, Jay-Z, Nas, Destiny's Child, Ludacris and many, many others expressively speak about his consequence. And an incredible success of his latest works with Nelly Furtado and Justin Timberlake only emphasize a weigh of his influence. Timbaland doubtlessly understands the significance his works carry but being a person whose ideas outstrip the time he seems getting tired from the musical cliches, which he has established himself. His second solo album Shock Value became an attempt to expand his artistic horizon and to discover new way for further growth. As Timbaland himself said "My mission is to blow up the boundaries and tear down the limits". For the sake of this task Timbaland has invited a whole bunch of starry guests to collaborate in his songs. The album features Fall Out Boy, Dr.Dre, She Wants Revenge, The Hives, Justin Timberake, 50 Cent, Nelly Furtado, Missy Elliot, One Republic and even Elton John. As a result the album's stylistic influences are scattered from fashionable nowadays Indie rock and 80's synth pop to R&B blockbusters. The Album's main single is Give It To Me. This is definitely a club hit, unhurried and filled with great number of different beat samples. There is not so many Timbaland here, Nelly Furtado performed about 60% of vocal parties and 20% went to Justin Timberlake. All tracks except the very first one where Timbaland raps alone present somebody from a long list of guest stars. Believe it or not but the brightest and the most interesting tracks here are those recorded with rock bands – Time with She Wants Revenge and One And Only with Fall Out Boy. Hip Hop of course presents here too. Such songs as Bounce or Come And Get Me will stay in the most often played track list of your player for a long time. Shock Value is certainly an experimental album. There are many ideas, styles and people mixed together here. This is a musical salad from a Hip Hop cuisine menu where synthesized beat and samples are the man ingredient. Actually, Timbaland coped with his task successfully. He blew up the bounders indeed, but he forgot to clear piles of broken walls pieces. The album has no cardinally new ideas though it is sensible that he is trying to find a new vein. All the guest stars help him of course but this is not a favor that can be called really useful for the album. A big quantity of performers interchanging each other on every single song makes Shock Value sound like a compilation rather than an album. Timbaland's reach experience saves the album – the production of every separate song is done greatly. But the album as a whole unit suffers from a sometimes-mediocre material. The problem probably lies in very high expectation of listeners and their demands of Timbaland. People are waiting for something extraordinary from him. But it is worth saying that his is a producer in the first place, not a rapper, and this is his first album since 1998. From this viewpoint everything begins taking its place. 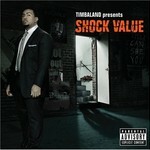 Shock Value is a sufficiently good album it has a great sound and big amount of unconventional for Hip Hop ideas. If you want to feel future tendencies listening is recommended.